Do you remember Billy Best? In 1994 at the age of 16, Billy Best captured the nation's heart when he left home in Norwell, Massachusetts, running away to escape chemotherapy. Suddenly his young photo appeared on the front pages from coast to coast as his parents and the police mounted a nationwide search for him. His story became everyone's passion as the television networks snapped up the story for Dateline, 20/20, A Current Affair, and more. 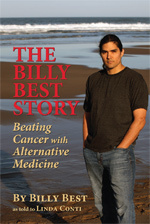 Thanks to an outpouring of support from the public, Billy began a journey of discovery to find an alternative treatment for his cancer. Eighteen years later and still cancer free, Billy Best has teamed up with Linda Conti of Sandcastle Memoirs in South Yarmouth to share his remarkable, triumphant story. Come meet Billy and Linda. Books will be available for sale and signing.